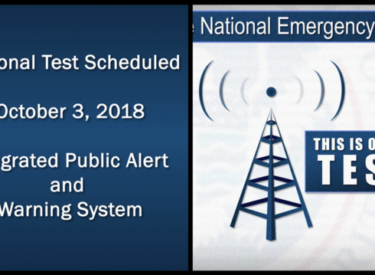 National Wireless Emergency Alert Test today at 1:18 p.m.
Beginning at 1:18 p.m. Wednesday, Americans across the country will be interrupted by an urgent notification on their cellphones. As it’s blasted out by cell towers nationwide over a 30-minute period, the message is expected to reach some 225 million people in an unprecedented federal exercise. Wednesday’s test of the Wireless Emergency Alerts system will mark the first time that emergency management officials will have used the nationwide alerting capabilities reserved for the office of the president. Unlike other types of emergency alerts, the presidential alert is designed to let the White House inform the entire country almost instantly of grave public emergencies, such as a terrorist attack or an invasion, according to the Federal Emergency Management Agency. And while Americans can choose not to receive weather and AMBER alerts, they cannot opt out of presidential ones. Despite its name, Wednesday’s presidential alert will not be issued by President Trump directly. But in general, the process calls for the president — or his representative — to authorize FEMA to send an alert on the White House’s behalf. The cellphone alert will be accompanied by a similar test of the Emergency Alert System, an older system that handles radio and television. Not all cellphones may receive Wednesday’s alert, however. You won’t get it if you aren’t in range of a cell tower, for instance, or if your phone is switched off. But that’s expected to be the case for only about a quarter of the nation’s cellphones.